Joshua, my very sweet and handsome now 17-year old gave me a small-sized format cookbook for Christmas called 200 Veggie Feasts. Despite the fact that he likes to accuse me of joining a cult, he’s nevertheless supporting my new health regime by giving me very well chosen cookbooks (he also gave me one called Salt that’s beautiful). I’ve tried a few recipes from 200 Veggie Feasts and they are really nice recipes! This one is no exception. Simple. Earthy. Like a vichyssoise with the freshness of peas and the pepperiness of arugula. Full of flavour and summery goodness. We had it with the mushroom toasts for a light Sunday supper. Heat the oil in a saucepan, add the onion, garlic, and thyme and cook over a low heat, stirring frequently, for 5 minutes until the onion is softened. Add the potatoes and cook, stirring frequently, for 5 minutes. Stir in the peas, stock, and salt and pepper. Bring to a boil, then reduce the heat, cover, and simmer gently for 20 minutes. 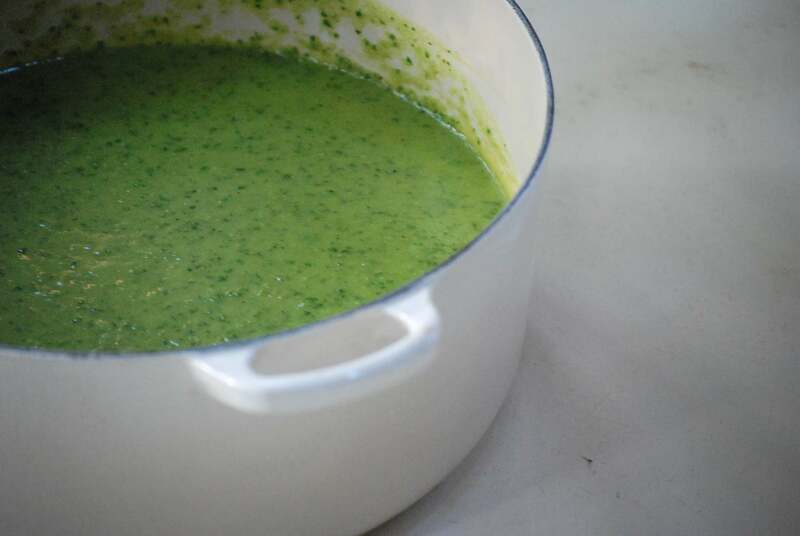 Transfer the soup to a food processor or blender, add the arugula and lemon juice and process until smooth. Return to the pan, adjust the seasoning, and heat through. Serve immediately, drizzled with a little extra oil.